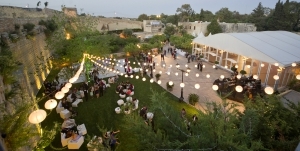 Malta is simply a dream destination to get married in. Mediterranean weather coupled with some fantastic venues that take full advantage of the island’s rich history and the lovely country and sea views make an unbeatable combination. Couples interested in a church wedding are spoilt for choice with some of the most beautiful churches and chapels you will find anywhere. Alternatively, civil weddings can be organised on the beach, in a castle or maybe in a luxury hotel’s lush gardens. The Maltese take their weddings very seriously and families invest a fortune to make sure everything is perfect on the special day. This means that anyone getting married in Malta, with some due diligence, can expect some top-notch service by experienced professionals. Whether a lavish event or an intimate occasion, it is always advisable to engage the services of a wedding planner which can easily be found by using a wedding service finder – the experience in organising such events and the legalities involved plus the contacts available amongst the local wedding community are really invaluable. We have also compiled a selective list of other Wedding service providers such as photography, wedding venues and caterers, bridal wear, florists, luxury wedding cars and musical services. Get Hitched is free to use, it works as a virtual wedding planner and is ideal for both local and foreign couples looking to ace their wedding preparations!